His Highness Sheikh Mohamed bin Zayed Al Nahyan, Crown Prince of Abu Dhabi and Deputy Supreme Commander of the UAE Armed Forces, today received, in the Presidential Palace, Shavkat Mirziyoyev, President of the Republic of Uzbekistan. During the official reception, the national anthem of Uzbekistan was played, and President Mirziyoyev, received a 21-gun salute. 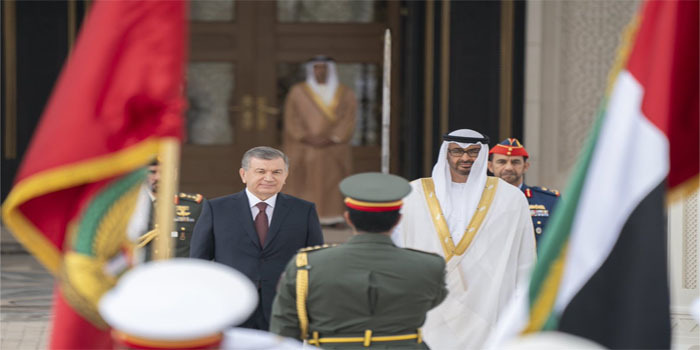 President Mirziyoyev saluted the Sheikhs, ministers and senior officials who received him while His Highness Sheikh Mohamed bin Zayed saluted the officials accompanying Meridaev. The reception was attended by Dr. Amal Abdullah Al Qubaisi, Speaker of the Federal National Council, FNC; H.H. Sheikh Tahnoun bin Mohammed Al Nahyan, Abu Dhabi Ruler’s Representative in Al Ain Region; H.H. Lt. General Sheikh Saif bin Zayed Al Nahyan, Deputy Prime Minister and Minister of the Interior; H.H. Sheikh Mansour bin Zayed Al Nahyan, Deputy Prime Minister and Minister of Presidential Affairs; H.H. Sheikh Hamed bin Zayed Al Nahyan, Chief of the Abu Dhabi Crown Prince’s Court; H.H Sheikh Khalifa bin Tahnoun, Executive Director of the Martyrs’ Families’ Affairs Office at the Abu Dhabi Crown Prince’s Court; Ahmed Juma Al Zaabi, Minister of the Federal Supreme Council at the Ministry of Presidential Affairs; Dr. Anwar bin Mohammed Gargash, Minister of State for Foreign Affairs; Obaid bin Humaid Al Tayer, Minister of State for Financial Affairs; Suhail bin Mohammed Faraj Faris Al Mazrouei, Minister of Energy and Industry; Noura bint Mohammed Al Kaabi, Minister of Culture and Knowledge Development; Dr. Thani bin Ahmed Al Zeyoudi, Minister of Climate Change and Environment; Nasser bin Thani Al Hamli, Minister of Human Resources and Emiratisation; Dr. Sultan bin Ahmed Al Jaber, Minister of State; Zaki Nusseibeh, Minister of State; Major General Hamad Mohammed Thani Al Rumaithi, Chief of Staff of the Armed Forces; and a number of senior officials. Mirziyoyev’s delegation included H. Sultanov, Advisor to the President; Elyor Ganiev, Deputy Prime Minister;Abdulaziz Kamilov, Minister of Foreign Affairs; Sardor Umurzakov, Minister of Investments and Foreign Trade; and Bakhtiar Khaderovic Ibrahimov, Ambassador of Uzbekistan to the UAE.